It is the time of the year, as a potentially hot summer approaches, that hay fever sufferers stress about. 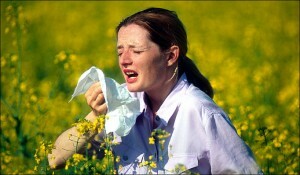 With pollen and heat abounding, sufferers can barely speak a sentence without blowing their nose or sneezing. And this waiting for the next sneeze can increase stress levels. But a Swiss study found that hay fever sufferers reported fewer symptoms after they were taught hypnotherapy. Close your eyes, take deep breaths, let go of your tension – and try to ignore the tickle in your nose. The study of 66 volunteers with hay fever took place over two years and encompassed two hay fever seasons, and the sub¬jects continued to take their normal allergy medications throughout. After a year, during which one section of the volunteers were taught to practise self-hypnosis, it was found that they had fewer symptoms than the volunteers who had not practised self-hypnosis. Scientific checks were made of the volunteers’ air-flow, and it was found that they could exhale more forcefully through their nose, even when exposed to substances that triggered their symptoms. Professor Wolf Langewitz, who conducted the study, said that hypnosis could work by altering the speed of blood flow through the tissues in the nose, helping to alleviate stuffiness and congestion. And Dr Peter Whorwell from Wythenshawe Hospital in Manchester, who uses hypnotherapy to treat people suffering from irritable bowel syndrome, said some of his own patients who also had hay-fever had commented to him that their noses were less runny after hypnotherapy sessions. Psychologist John Gruzelier, at Imperial College London and editor of the journal Contemporary Hypnosis states that hypnosis may be an effective medical approach for many ailments. He also suggests that self-hypnotherapy might improve hay fever symptoms by regulating the immune system. But, besides the self-hypnosis option, a qualified hypnotherapist from the National Council for Hypnotherapy (NCH) can offer effective treatment for stress and anxiety which, in turn, can lessen the onset of hay fever. A therapist can also teach the client self-hypnosis or offer an MP3 recording specifically tailored to counter or reduce hay fever. This can reduce hay fever by causing a reduction in symptoms like congestion and runny nose.